WHAT: OM is an Odishi dance workshop by acclaimed Kolkata-based Odishi dancer Shashwati Garai Ghosh. FOR: All those who are 18+, and have atleast 1 year experience in Odishi, or 2 years in another dance form. 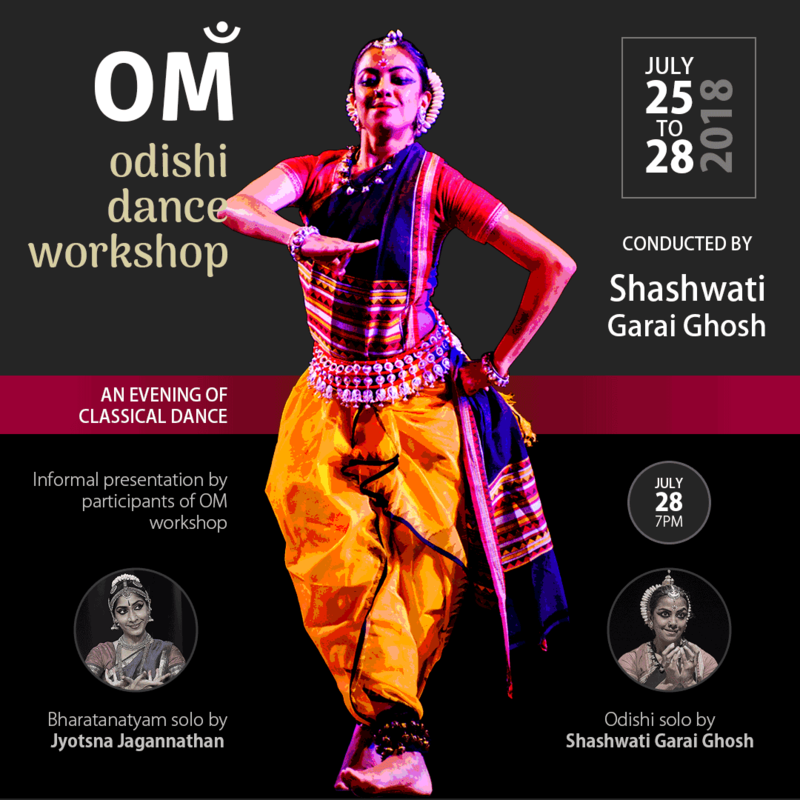 OM is a travelling workshop started by Kolkata-based acclaimed Odishi dancer Shashwati Garai Ghosh. An initiative to share her experience, and passion for Odishi with young dancers outsider her home city. OM is a four-day workshop crafted to help budding dancers appreciate the Odishi dance form through sessions of intense Odishi training, physical conditioning, and meditation. The workshop culminates in an informal presentation put together by participants. This module will help the dancer with: Concentration, Patience, Physical-strengthening, Flexibility, Balance, Injury-prevention, Self-transformation. a series of intricate footwork specific to Odishi, which will strengthen the form through discipline, precision, and the rhythm of Odishi. Final day of the workshop is a celebration of Classical Dance. An evening to inspire and enthral audience. The participants will put together a presentation based on the workshop sessions. Solo recital by talented Bharatanatyam dancer Jyotsna Jagannathan. Solo recital by Shashwati Garai Ghosh. Kolkata-based Shashwati Garai Ghosh is widely acknowledged as one of the best Odishi dancers today. She is the most senior disciple of internationally acclaimed dancer and choreographer Sharmila Biswas, and has been dancing for over 20 years at the highest level. Shashwati has performed at the most prestigious festivals and venues in India and abroad. She received the 2016 Bismillah Khan Yuva Puraskar for Odissi. In Kolkata, she runs her own Odishi dance institute: Angashuddhi – Home for Odishi. This is her initiative to nurture, and pass on the experience of learning Odishi dance to the next generation. Shashwati regularly conducts workshops for schools and institutes around India.